High Yield Bonds were enticing for income investors, including me, while we were in a low interest rate environment. 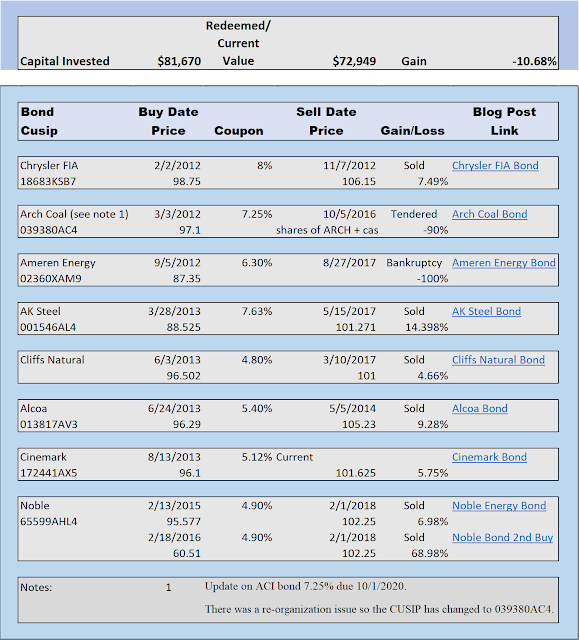 Since I started writing this blog about income investing, I invested $81,670 in high yield bonds. Each buy was for 10 bonds. Eight different bonds make up the portfolio. The table below lists the bonds I bought with CUSIP, coupon rate, and maturity date. The portfolio holds only one of the eight bonds. The others defaulted, were redeemed or tendered. It was a rocky and mostly unsuccessful venture. My $81,670 turned into $72,949 not including income. That is a 12% loss. When adjusted for income the loss is cut to 4% but I don't like losing money. If you read the dividend ideas on this blog you will see over the same time frame, I bought $875,687 worth of stocks. 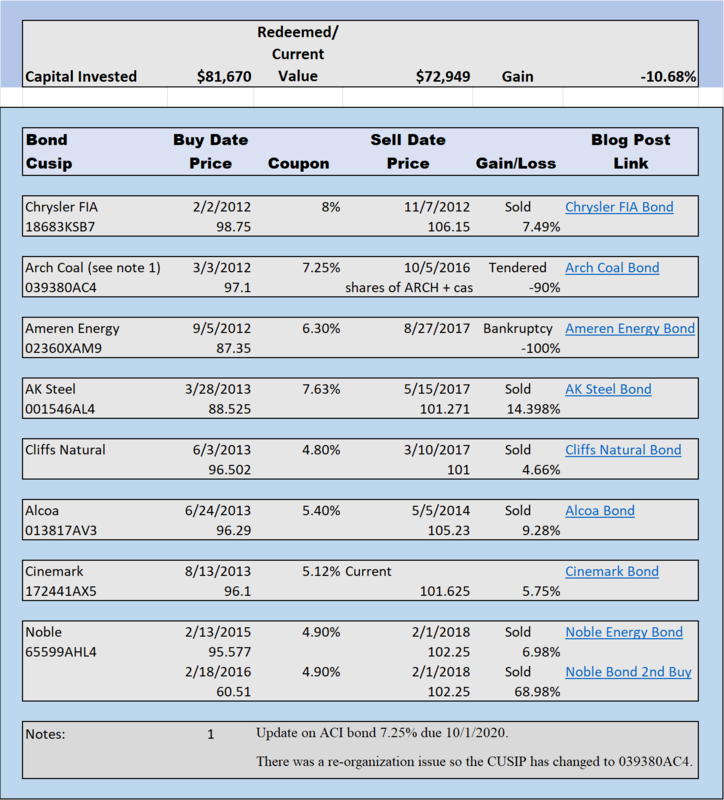 The high yield bonds make up about 9% of the investments that I track in my portfolios. That alone is a good lesson. If you are going to take risk, you must keep it to a minimum. It is a tricky business that requires even more due diligence than buying a dividend stock. Bonds are distressed for a reason and that is risk. As we leave the 35 year bond bull market and enter what I believe to be a 20 year bond bear market, high yield bonds are not as necessary even though they can be very rewarding (see Noble Energy Bond above.). I intend to ride the new cycle of increasing interest rates. For average risk bonds I would like 5% for five years. When bond prices decrease enough that I can get 5% for five years, I may change my mind and want more. We will see. Since I believe interest rates are going up, I think there will also be high yield opportunities. There is always some company that needs to pay just a little more to get financing. It is our job as investors to find the right companies. As I find bonds I like, I will write them up on this page and I will add them to the portfolio so you can measure how I have done. Disclosure: Long Cinemark Bond However since the price is above par, I am tempted to sell soon.